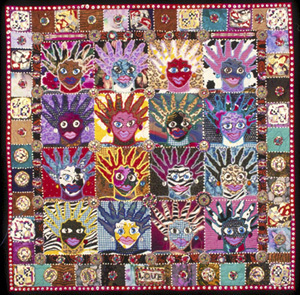 Current KALEID artist Therese May will have an art quilt in the new exhibit �Saturn Returns� at the San Jose Museum of Quilts and Textiles, October 16 to January 6, 2008. This 30th anniversary exhibition will celebrate the future of fiber art by honoring the artists whose work will inspire the next generation of fiber artists. Saturday, October 27, 9am-5pm Ring around the Bay Bus Tour with Therese May, Lia Cook, Joan Schulze, Judith Content. Click here for more info. Therese will also be teaching an online class on the �Quilted Portrait� beginning October 27th. More info here. This page contains a single entry from October 13, 2007 2:09 PM. The previous post in this blog was Thursday Gig's Art & the Spoken Word October 18th. The next post in this blog is Ema Harris -Sintamarian at Jack Fischer Gallery SF.